How Does New York's Section 25A Liability Affect My Case? How Does New York’s Section 25A Liability Affect My Case? For claimants, older cases can be transferred from the liable insurance carrier to a New York State agency known as the Special Funds Conservation Committee. Section 25A of the Workers’ Compensation Law outlines which cases may be transferred and under what circumstances this may occur. Many times a claimant will receive a notice for a hearing many years after the injury has become inactive. The notice of hearing may indicate “Question of Section 25 liability.” In such circumstances, it is advisable for the claimant to appear at the hearing although the findings will usually not have any direct impact on the claimant’s entitlement to benefits. Instead, the hearing will usually revolve around whether the insurance company retains liability or the case is transferred to the Special Funds Conservation Committee for handling. 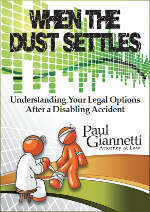 If you have questions regarding your New York State Workers’ Compensation claim, contact Paul Gianetti Attorney at Law.